O controle da malária, em área de construção de hidrelétricas no ecossistema amazônico, pode ter êxito? Malaria control in area of hydroelectric construction on the Amazonian ecosystem can succeed? ¿El control de la malaria, en área de construcción de hidroeléctricas en el ecosistema amazónico, puede tener éxito? Malaria remains one of the most important public health problems in Brazil. The construction of large dams generates economic and social benefits and improves the quality of life of the population; however, it creates a great environmental impact, which may affect human health. This study aimed to prevent negative environmental impacts and to enhance positive impacts in the area of influence of the hydroelectric power plant in Belo Monte, Pará State, Brazil. This ecological study was conducted in order to evaluate the structure and procedures for malaria control in five municipalities located in the area of direct influence of the hydroelectric construction: Altamira, Anapu, Brasil Novo, Senador José Porfírio, and Vitória do Xingu. Early diagnosis and treatment, and use of mosquito nets impregnated with long-lasting insecticides were the main measures applied in a strategy of integrated care. The incidence of malaria evaluated in these municipalities decreased from 6,275 cases in 2011 to 79 in 2015, and no cases of falciparum malaria have been reported in any of them since April 2014. The measures and the strategy applied were quite effective in controlling malaria. The improvement of public management coupled to the guarantee of financial support was essential to reach the planned objective. A malária permanece como um dos mais importantes problemas de saúde pública no Brasil. A construção de grandes represas gera benefícios sociais e econômicos e promove a qualidade de vida da população; entretanto, cria um grande impacto ambiental que pode afetar a saúde humana. Este estudo visou à prevenção de impactos ambientais negativos e ao aumento dos impactos positivos na área de influência da usina hidrelétrica em Belo Monte, Estado do Pará, Brasil. Este estudo ecológico foi elaborado a fim de avaliar a estrutura e procedimentos para o controle da malária em cinco municípios localizados na área de influência direta de construção da hidrelétrica: Altamira, Anapu, Brasil Novo, Senador José Porfírio e Vitória do Xingu. Diagnóstico e tratamento precoces e o uso de mosquiteiros impregnados por pesticidas de longa ação foram as principais medidas aplicadas em uma estratégia de cuidados integrados. A incidência de malária avaliada nesses municípios caiu de 6.275 casos em 2011 para 79 em 2015, e nenhum caso de malária causada por Plasmodium falciparum foi relatado em qualquer um deles desde abril de 2014. As medidas e a estratégia aplicadas foram bastante eficazes no controle da malária. Uma melhor gestão pública juntamente com a garantia de suporte financeiro foram fundamentais para alcançar o objetivo planejado. La malaria permanece como uno de los más importantes problemas de salud pública en Brasil. La construcción de grandes represas genera beneficios sociales y económicos y promueve la calidad de vida de la población; sin embargo, crea un gran impacto ambiental que puede afectar a la salud humana. Este estudio tuvo como objetivo la prevención de impactos ambientales negativos y el aumento de los impactos positivos en el área de influencia de la usina hidroeléctrica en Belo Monte, Estado de Pará, Brasil. Este estudio ecológico fue elaborado con la finalidad de evaluar la estructura y los procedimientos para el control de la malaria en cinco municipios localizados en el área de influencia directa de construcción de la hidroeléctrica: Altamira, Anapu, Brasil Novo, Senador José Porfírio y Vitória do Xingu. El diagnóstico y el tratamiento precoces y el uso de mosquiteros impregnados en pesticidas de larga duración fueron las principales medidas aplicadas en una estrategia de cuidados integrados. La incidencia de malaria evaluada en esos municipios disminuyó de 6.275 casos en 2011 para 79 en 2015, y ningún caso de malaria causada por Plasmodium falciparum fue informado en ninguno de ellos desde abril de 2014. Las medidas y la estrategia aplicadas fueron bastante eficaces para el control de la malaria. Una mejor gestión pública, junto a la garantía de apoyo financiero fueron fundamentales para alcanzar el objetivo planificado. The construction of large dams generates economic and social benefits and improves the quality of life; however, they also produce great environmental impacts, which may affect human health because increase the incidence of infectious and non-infectious diseases, accidents, violence, and psychosocial disorders1,2. Therefore, it is essential the development of studies and public health programs aimed at preventing the negative environmental impacts and maximizing positive health effects for the population living in the influence area of enterprises of this nature. Large enterprises in the Brazilian Amazon, such as the construction of hydroelectric power plants (HPPs), are one of the determining factors for malaria transmission. Thus, the National Environmental Council (Conselho Nacional do Meio Ambiente - CONAMA) issued Resolution No. 286 of 17 December 2001, determining that the projects whose activities increase the risk of malaria transmission in endemic areas should develop epidemiological studies and implement programs for its control during all phases of the projects3. A diagnosis of the health status in the municipalities located in the area of direct influence (ADI) and indirect influence (AII) of the Belo Monte HPP was conducted before the beginning of construction, which, together with the population characteristics in these areas, resulted in both the prediction of the environmental conditions that could affect the health of the population and the proposal of measures to prevent and control the negative impacts and to enhance the positive impacts4. Malaria remains a serious public health problem worldwide, with 3.2 billion people at risk in 97 countries. According to the data of the 2015 World Malaria Report of the World Health Organization (WHO), between 124 and 283 million new cases and between 367 and 755 thousand deaths due to malaria were estimated in 20135. As expected, this disease could be spread in the Belo Monte HPP region, since vector mosquitoes species were present and malaria parasites, mainly Plasmodium vivax and Plasmodium falciparum, were circulating among the human population. The National Malaria Control Program (Programa Nacional de Controle da Malária - PNCM) of the Ministry of Health of Brazil (MS) has followed the guidelines of the WHO to improve control and to implement new strategies. Thus, adequate diagnosis and proper and immediate treatment, along with additional vector control measures, including indoor spraying of insecticides, and use of mosquito nets impregnated with long-lasting insecticides (LLINs) in susceptible areas, have resulted in gradual decreases in the number of malaria cases, hospitalizations, and deaths in Brazil6,7,8,9,10. The Development License from the Brazilian Institute of Environment and Renewable Natural Resources (Instituto Brasileiro de Meio Ambiente e dos Recursos Naturais Renováveis - IBAMA) was obtained by Norte Energia S.A. (NESA), the contractor responsible for the construction of the HPP in Belo Monte, in February 2011. This license allowed the development of the initial activities in the Belo Monte HPP11. The axis of the main dam (Pimental site) is located on the Xingu river, approximately 40 km downstream of the City of Altamira, in Pará State. This dam will form the Xingu reservoir, with the area of 386 km². From the Xingu reservoir, the water flow is diverted through the spillway to the main powerhouse (Belo Monte site), forming the intermediate reservoir with the area of 130 km² and generating a stretch of approximately 100 km on the Xingu river, characterized to be a residual flow. The reservoirs to be formed by the project will affect the Cities of Vitória do Xingu, Altamira, and Brasil Novo12. IBAMA included the following municipalities in ADI: Altamira, Anapu, Brasil Novo, Senador José Porfírio, and Vitória do Xingu (Figure 1). These five municipalities have the total geographical area of 195,265 km² and population of 170,418 inhabitants, surveyed in 2010 by Brazilian Institute of Geography and Statistics (Instituto Brasileiro de Geografia e Estatística - IBGE)13. The project in Belo Monte has increased the migratory flow due to labor opportunities. Demographic studies conducted during the environmental impact assessment (EIA) showed that 96,000 people will be mobilized; among them, 22,000 (23%) already reside in the region, and 74,000 (77%) will migrate to the area14. The NESA Malaria Control Program (MCP) was prepared by managers from the three levels of government, which required a total value of approximately R$ 36.8 million (~ US$ 18 million) and that has been applied since March 2011 and will continue until March 2017, in order to guarantee the diagnosis quality, proper and immediate treatment by qualifying local human source, distribution and monitoring of LLINs and the malaria transmission monitoring by specialized professionals. Approximately R$ 30 million (~ US$ 6 million) had been applied until December 201515. 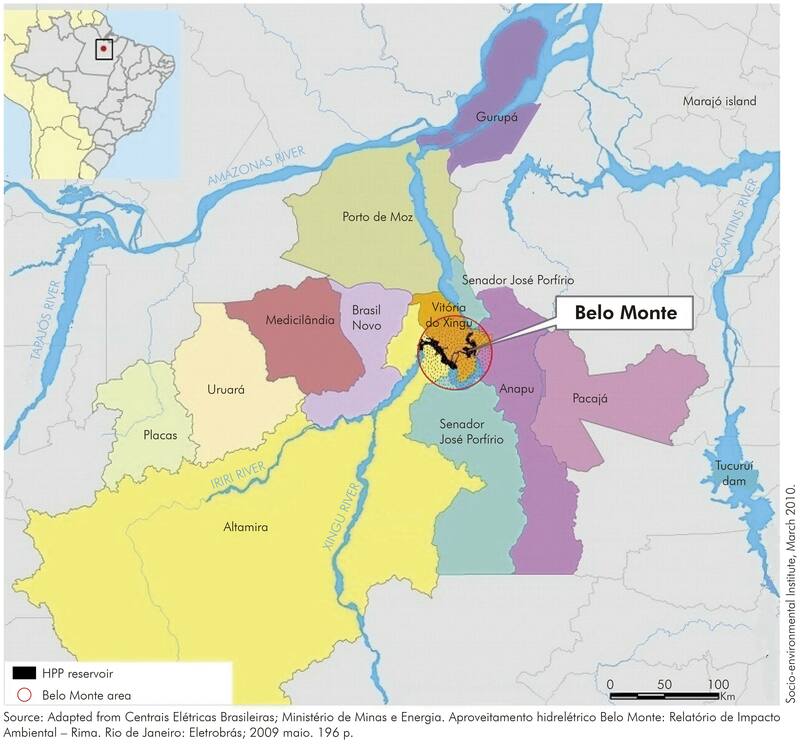 This study aimed to assess the status of malaria transmission in five municipalities located in the ADI - Altamira, Anapu, Brasil Novo, Senador José Porfírio, and Vitória do Xingu - before and during the construction of the Belo Monte HPP. This epidemiological and ecological study for the evaluation of interventions in public health was performed in the Municipalities of Altamira (3º11'41" S; 52º12'33" W), Anapu (3º28'11" S; 51º12'33" W), Brasil Novo (3º20'16'' S; 52º34'28" W), Senador José Porfírio (2º34'52" S; 51º56'14" W), and Vitória do Xingu (2º53'2" S; 52º0'17" W), located in the ADI of the Belo Monte HPP13. For the implementation of the MCP, it was conducted the recruitment of health professionals and the acquirement of equipments, vehicles, and supplies to the Secretariat of Health of the Pará State (Secretaria de Estado de Saúde Pública - SESPA) and the Secretariats of Health of each municipality in the ADI to perform activities related to malaria control. The overall coordination of activities was performed by a university-level specialist in malaria control16. The strategy of integration between health surveillance and primary healthcare was a prerequisite for the implementation of integrated care and to achieve the expected results, and the development of labor should be consistent with the reality of the local communities16. The training of professionals involved in the development of distinct activities, and the supervision of field activities were under the responsibility of SESPA. The execution of field activities was the responsibility of the municipal departments, and the labor activities at the construction sites were under the responsibility of the contractor16. The number of workers at the Belo Monte HPP construction sites reached approximately 33,000 at the peak of the construction work, and they were subjected to a thick smear test for the diagnosis of malaria at the time of admission. Those with positive results were maintained in suitable locations - where windows were screened and covered with mosquito nets impregnated with LLINs - and were adequately treated with insecticides; in addition, they were allowed to start their activities only after disease management (cure). During work activities, workers with fever or suspicion of malaria underwent examination for disease diagnosis. Each year, approximately 50,000 tests were performed in the laboratories located at the construction sites16. Quarterly meetings were held by representatives of the Secretariats of Health of the State and Municipalities and of NESA, in order to monitor the MCP activities. These meetings were crucial for the monitoring and detection of possible obstacles and for the proposal of adjustments necessary for the proper development of the program and served as an in-service training program for professionals involved in the coordination of the MCP at the municipal level16. The municipalities located in the ADI in the Belo Monte HPP, after the implementation of the MCP, distributed 45,000 LLINs in all areas of high and medium risk for malaria transmission. The distribution consisted of the installation of mosquito nets, guidance as to their use, and provision of a schedule for washing the nets. Additionally, the monitoring of the durability and efficacy of the LLINs were performed in 2014 by collecting 30 unities by locality. All collected LLINS were replaced. Indoor spraying was rarely used because of the low effectiveness of this control measure considering the type of housing common in malaria endemic areas (houses with incomplete or missing walls)16. Thermal fogging was selectively and exceptionally used in specific areas depending on entomological and epidemiological conditions, including areas of mining or lack of vegetation, as was the case in the Belo Monte HPP sites. In addition, the vector control agents were trained by the core teams of MS and SESPA16. Malaria vector monitoring in strategic points of the Belo Monte HPP construction sites was conducted by Instituto Evandro Chagas of the MS, based in Ananindeua, Pará State following the same methodology used on the EIA study4. To implement or improve existing strategies, human resources were hired, various work teams were trained for different activities and procedures were adopted to improve the management and infrastructure services. Diagnostic and treatment units were created and equipped16. The locations of the municipalities were georeferenced and registered in the Epidemiological Surveillance Information System for Malaria (Sistema de Informações de Vigilância Epidemiológica da Malária - Sivep_Malária) of the MS16,17. The percentage of positive smears in relation to the total examined and the percentage of treatments initiated within 48 h of the first symptoms were calculated. The impact of control activities was measured according to the number of malaria cases per year, the percentage of cases of falciparum malaria, the number of hospitalizations, and the number of deaths due to malaria16. The following data sources were used: the Sivep_Malária/MS, the Hospital Admissions System of the Unified Health System (Sistema de Internações Hospitalares do Sistema Único de Saúde, Datasus/MS), the Mortality Information System (Sistema de Informações de Mortalidade, Datasus/MS), the IBGE, the archives and the biannual consolidated reports of NESA8,9,13,16. In the four-year study period, from 2011 to 2015, the incidence of malaria in Pará decreased from 116,105 cases in 2011 to 9,583 in 2015 (decrease of 91.7%). The incidence of malaria in the five municipalities evaluated decreased from 6,275 cases in 2011 to 79 cases in 2015, varying between 97.1% in Altamira to 100% in Brasil Novo, as shown in table 1. Conventional sign used: − Numeric data not equal to zero due to rounding. The number of cases of falciparum malaria decreased 100% in the period. No cases were reported in Brasil Novo, Senador José Porfírio, and Vitória do Xingu in 2014. Altamira recorded only two cases. The highest number of cases occurred in Anapu, with 18 cases. Moreover, no cases of falciparum malaria have been reported in these five municipalities since April 2014 (Table 2). The number of hospital admissions due to malaria decreased 80% in the same period. There were no reports of death due to malaria in these five municipalities in the four years. The average percentage of malaria treatment within 48 h of the onset of the first symptoms increased from 47.2% in 2011 to 89.3% in 2015. All municipalities had improved the treatment access (Table 3). The average percentages of positive smears were 18.7% in 2011 and 0.1% in 2015. The analysis by municipality indicated that this percentage varied from 0.1% in Vitória do Xingu to 0.8% in Anapu in 2015 (Table 4). The analysis of durability and efficacy of the LLINs was performed in 30 unity by locality, and the results showed, in general after one year of use, that the integrity was maintained and the insecticide was still effective (unpublished observations). In the period of this study, it was observed a diversity of 10 anopheline mosquitoes species, almost all the same as those reported during the EIA, and Anopheles darling has been found in the study areas and is the main infected specie founded. The MCP was conducted in the municipalities in the ADI of the Belo Monte HPP with the participation of managers of several governmental levels16. The decision to establish a regional coordination, a coordination for each municipality and to train these coordinators to organize the implementation of the work, from planning and follow-up actions to data feeding into information systems, was an important starting point for the success of the MCP. The establishment of CONAMA's Resolution No. 289/2001 was essential to guide the process of environmental licensing of the enterprises located in the Amazon Region with regard to malaria control. Great development projects in the Amazon, including railways, HPPs, agricultural settlements, and extractive activities, among others, were unfeasible or had major obstacles to their implementation18. Therefore, the regulation of CONAMA for large enterprises in malaria-endemic areas was a great opportunity to advance the resolution to eliminate malaria transmission in the areas of implementation of these projects3,18. These guidelines were regularly followed19 with monitoring by the MS, through the General Coordination of PNCM and the Department of Communicable Disease of SESPA. Monitoring was performed through surveillance programs in the municipalities and construction sites, quarterly review meetings, and biannual reports prepared by the contractor. After the initial inspections, assessments, and reports, opinions were issued with a number of recommendations for adjustments to the implementation of the MCP. Subsequently, the opinions issued in the reports were restricted to the maintenance of ongoing actions. Therefore, strict monitoring by the MS was an important factor in the success of malaria control in the municipalities evaluated. The establishment and implementation of the MCP in Belo Monte was initiated with a broad political mobilization and the participation of managers of the three levels of government and involved the preparation of a strategic plan covering every aspect of its development and the stimulation of the integration between the public and private sectors14. This participatory strategy was an important aspect in the entire process, considering that assessment meetings were conducted quarterly to detect obstacles to malaria control and to propose appropriate measures of adjustment. Furthermore, this system has been a continuous in-service training process for the managers and may facilitate the sustainability of the positive results achieved thus far. The strengthening of the structure of the 10th Regional Health Center (Centro Regional de Saúde - CRS) from SESPA deserved compliments in the development of its competencies in training and supervision of the municipalities14. This strategy can also be essential for the sustainability of the results obtained thus far. The MCP promoted training of professionals involved in the action plan and improved administrative and operational structures of the 10th CRS from SESPA, and health secretariats in the municipalities evaluated. During the study period, necessary supplies for development of the program - fuel, materials for laboratory diagnosis, medicines, mosquito nets, and insecticides in the service network - were provided on a regular basis14, which is also a guarantee for activities success. The improvement of computer services in health departments of each municipality and in the 10th CRS, the supply of equipment, georeferencing of locations, and a rigorous data-feeding system with agility and quality14, enabled the availability of quality information for the planning and monitoring of disease control measures. Although the integration of actions between primary healthcare services and malaria control actions were predicted in the agreement14, it was observed that, despite the efforts, integration of these activities was not satisfactory since in the localities of high malaria transmission there were no professionals of the primary care services. The decreased time of access to diagnosis and treatment and the performance of hematoscopy surveys in the few municipalities with persistent disease transmission enabled the rapid interruption of the source of infection, particularly due to the detection and treatment of asymptomatic patients. As reported elsewhere, well-trained microscopists are crucial for getting a precise and rapid diagnosis, which play an important role on the transmission interruption. Installation of mosquito nets impregnated with LLINs and the annual monitoring of the durability and efficacy of them, appears to have been an important tool in controlling the disease in the areas of medium and high risk of transmission, which leads us to realize the importance of indoor transmission of malaria in the region. Malaria vector monitoring is also an additional tool that helps to understand the transmission dynamics and the efficacy of vector control strategies. During the EIA, 2007 and 2008, the entomological survey (collection of adult and immature Anopheles mosquitoes - human malaria vectors) evaluated the risk of malaria transmission. The general diversity of mosquitoes species was 10 (An. darlingi; An. albitarsis s.l; An. nuneztovari; An. triannulatus; An. intermedius; An. brasiliensis; An. oswaldoi; An. evansae; An. strode; and An. peryassui). An. darlingi was the most frequent and infected specie by human Plasmodium (infection rate ranged from 0.62 to 1.1); and the only one infected by Plasmodium falciparum and present among the studied municipalities4. Recommendation of prevention and control measures was made in the five targeted municipalities during and after the construction of the HPP4. In this study, it was observed a decrease of density of malaria mosquito's vector and infection rate, which was not observed in other similar enterprises as Tucuruí power plant20. The systematic monitoring through quality and regularly updated information, together with the quarterly evaluation process, have enabled us to assess the impacts of the implemented measures, to adequately adjust control measures, and to keep the technical staff updated about the malaria problem in the region. Regarding the impact of the adopted strategies control, the implementation of MCP in five evaluated municipalities has allowed the integration of the control strategies, adjusted to local conditions of transmission, ultimately resulting in a 93.6% decrease in the disease incidence. It is of note that, starting in 2008, the total number of cases in these five municipalities, whose average was higher than 6,000 cases, showed a tendency of growth but was reversed in 2011 with the implementation of the MCP. At present, the interruption in malaria transmission is feasible, particularly for falciparum malaria, and no cases have been reported since April 2014 produced by this species. The decrease of malaria cases in Pará State, on the same period, was also about 90%, while in relation to falciparum malaria Belo Monte HPP area decreased to zero and Pará State increased from 14.7% to 20.9%17. The fact of no cases of falciparum malaria had been reported in the area of Belo Monte HPP was reflected in the indicators of disease severity, with a sharp decrease in the number of hospitalizations and the absence of malaria deaths since the plan's implementation9,10. Beside all these facts, it is unquestionable the importance of the CONAMA Resolution about the epidemiological studies and strategies to be performed in areas of big environmental intervention with ecological damage3,18, and integrated strategies for controlling malaria transmission7,8, and the supervising by the PNCM of the MS15. The report from the Getúlio Vargas Foundation (Fundação Getúlio Vargas) for the monitoring of constraints in the Belo Monte HPP to the Technical Chamber for the Monitoring of the Sustainable Regional Development Plan (Plano de Desenvolvimento Regional Sustentável) in Xingu, in the chapter that analyzed the MCP, highlighted that "it is essential to study and understand the institutional arrangements that resulted in success, which should lead to the creation of a 'Strategy Map' with the intention to inspire other areas"21. The CONAMA and IBAMA Resolutions, and the MS supervising were crucial for the development and implementation of the MCP aiming the quality of professionals training and control strategies were quite effective in controlling malaria in the five targets municipalities of this study. The NESA PCM activities coupled with the improvement of public management were essential to strengthen the partnership for implementing the plan through the municipalities, with support from the Secretariat of Health of the Pará State and the MS. However, in future assessments of the MCP, a thorough analysis of the action plan should be conducted to adjust it to a new goal of eliminating malaria transmission in the evaluated municipalities, considering the epidemiological surveillance and the implementation of effective measures for the interruption of transmission. To Crissiane Costa Reis, Deocleciano Galiza Primo, Ediane Marli Rodrigues dos Reis, Edvaldo Paixão Santa Rosa, José Élson Abud de Araujo, Noel Fernandes Neto, Raimundo Nonato da Luz Lacerda, and Raimundo Tadeu Lessa de Souza for their technical support on the field and laboratory work. To the staff of the NESA MPC for their logistical support, especially to Gecilda Aparecida de Lima, and Katia Lopes Fernandes. The authors declare that there are no conflicts of interest associated with this publication. Two authors are employees of Norte Energia S/A Company.